Apple CarPlay will be able to stream third-party navigation apps, such as Google Maps or Waze, when the company rolls out its next operating system update this autumn. CarPlay enables users to stream selected apps to the car’s own display. 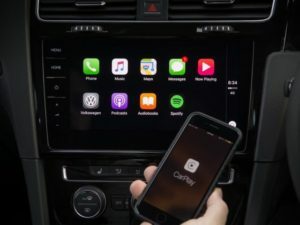 Announced as part of Apple’s Worldwide Developers’ Conference (WWDC) this week, iOS 12 will be the first time that CarPlay has enabled users to bypass the Apple Maps app since the software launched back in 2014 – a restriction which has frustrated many users. CarPlay enables users to control selected apps via a the built-in infotainment screen. It is part of the software on the iPhone or iPad, and will be delivered as part of an over-the-air update to the handheld device, rather than requiring any changes to the vehicle. Apple had previously faced criticism for making a similar restriction for handheld devices. Early versions of iOS had bundled Google Maps as the default navigation app, until Apple Maps launched with iOS 6 and Google’s alternative took several months to follow. Google Maps and Waze are the most popular free navigation apps on the Apple App Store, despite both being developed by Google, which also produces the rival Android operating system.